Lighting accounts for around 18 percent of the typical annual household electricity consumption. Reducing your lighting costs is a great way to make significant savings in a relatively easy way. Households typically use standard light fittings and downlighters or spotlight fittings. It is possible to purchase energy efficient bulbs that will fit into both of these fittings. There are two main, energy efficient alternatives to the typical incandescent lighting available in the UK. These are: Compact Fluorescent Lamps (CFLs) and Light Emitting Diodes (LEDs). 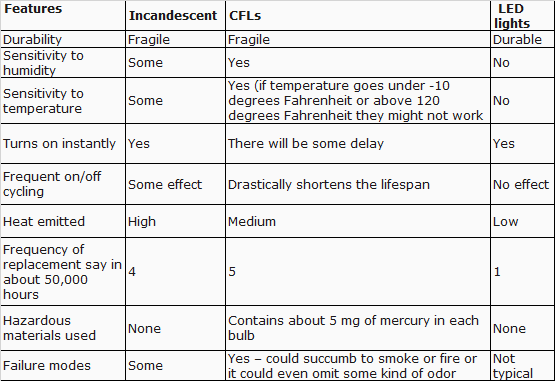 CFLs are a common lighting solution for more general requirements. Replacing a traditional bulb with this would save around £3 a year or £50 over the bulbs lifetime. Although sounding small, replacing 10 bulbs in the house would save £30 a year or £500 over their lifetime. Converting to LED lamps is a great way to reduce your energy use and they last much longer so no need to replace them for years providing you buy quality LED lamps. You do get what you pay for and the cheap LEDs will probably not last long at all. Look for the guaranteed lifetime. The two tables below give an idea of the savings you can make and the advantages and disadvantages of the different types of lamps. Another difference with LEDs is that the important figure is the light output (lumens) not Watts to get the right brightness. Watts are important as they tell you how much energy the light will use when it’s on but you need to get the brightness right – the lumens – and the colour. You have a choice of light colour given by the temperature (K) and it’s given on the packaging along with the lumens. 2700 Kelvin (K) gives a warm yellowy light similar to that of an incandescent lamp. The higher the temperature the bluer the light becomes giving a cooler light so you might want to choose 3000K or 3500K for a reading light. LED lamps use in the region of 50% less energy than an equivalent CFL (Compact Fluorescent Light) and 90 -95% less energy than an incandescent lamp (‘old’ style light bulb). Lowers your energy bill and reduces greenhouse gas emissions (CO2e). LEDs last for 30,000 – 50,000 hours (about 10 – 17 years if used for 8 hours every day of the year) compared to an equivalent CFL with a lifetime of about 20,000 hours, or much less if the light is only on for periods of less than 15 minutes, and an incandescent lamp will only last 1,000 – 2,000 hours. Fewer replacement lamps and therefore less landfill. LEDs switch on to full brightness immediately and don’t flicker whereas CFLs though they have improved over the years still take a little time to come to full brightness and can appear to flicker. Lack of flicker reduces the risk of causing migraines or epileptic episodes. LEDs are not affected by cold temperatures whereas CFLs don’t like it cold and take a long time to come on – very noticeable if you have a fluorescent light of any type as an outside light. Both types of lamps are sensitive to over-heating if fitted in an enclosed fitting with no way of ventilating excess heat but CFLs are more so then LEDs. 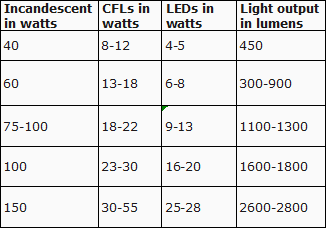 LEDs are very robust compared to CFLs or incandescent lamps which break easily. When buying LEDs you need to know what sort of light you want; Clear bright light that you can work by or more atmospheric lighting. The light colour of LEDs is given by the temperature in Kelvin (K). This will be given on the packaging and a temperature of 3,000K (or higher) will provide clear bright light usually called ‘cool white’. The temperature for a more atmospheric light, usually called ‘warm white’ is about 2,700K (or lower). The lower the temperature the more yellow the light and the higher the temperature the more blue the light. The disadvantage of LEDs is the upfront cost but this should be considered in the light of lower energy use and fewer replacement lamps needed. Don’t be tempted to buy cheap LEDs as these might not last as long as they should – go for the guaranteed lifetime lamps. Lighting habits contribute greatly to how much electricity your lighting consumes. Changing these habits is a completely free way to save money.